Innovative coffee chillers, chic luggage, powerful earphones, and more are a fraction of the price this weekend. Everyone needs an efficient carry-on these days. Baggage fees are only getting more and more expensive, and it’s the last thing you want to spend your hard-earned cash on. A lightweight, chic carry-on is absolutely essential. The Genius Pack Aerial Hardside Carry On Spinner is the answer to all your packing concerns. It features 360º durable spinner wheels, a secluded laundry compartment to separate dirty and clean clothes, interior compartments for socks, chargers, and undergarments, and molded side feet to keep everything protected. If you’re looking for a smartwatch but don’t want to sacrifice style, look no further than the MIM Hybrid Smartwatch. Track your steps, distance traveled, and calories burned, monitor your sleep, get all your notifications of incoming calls, messages, and security alerts, and control your smartphone camera from a distance, all while looking chic and elegant. 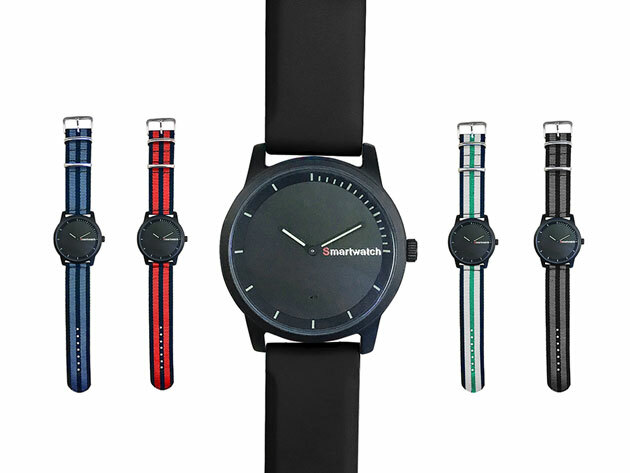 This watch also boasts the longest battery life in the world, lasting up to 730 days. With our special Black Friday deal, make the MIM Hybrid Smartwatch a part of your life for only $49 ! The BauBax sweatshirt is an absolute wonder—and a lifesaver for any type of traveler. 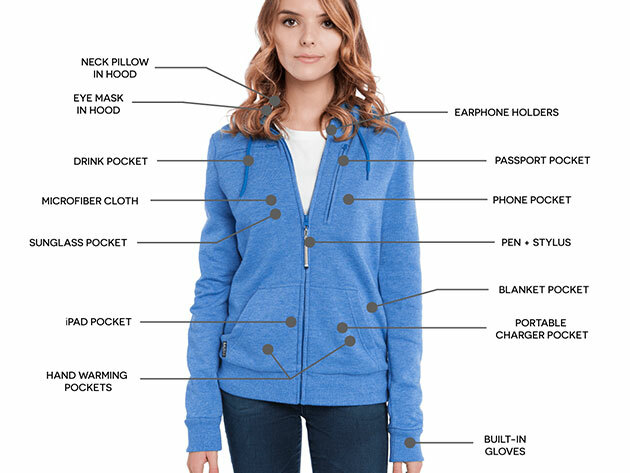 This ingenious garment features nine utility pockets for storing everything from drinks (yes, you read that right) to your phone, tablet, passport, glasses, and even a blanket. Of course, storage is essential when you’re traveling, but this jacket boasts even more incredible accouterments! The zipper turns into a pen and stylus, there are built-in fingerless gloves in the sleeves, an eye mask resides in the hood, and a neck pillow hidden in the hood inflates in two seconds. It’s no surprise then that it usually retails for $200, but with our Black Friday price drop, it can be yours for only $109.99 . Go HERE to peruse even more inventive travel garments from BauBax. 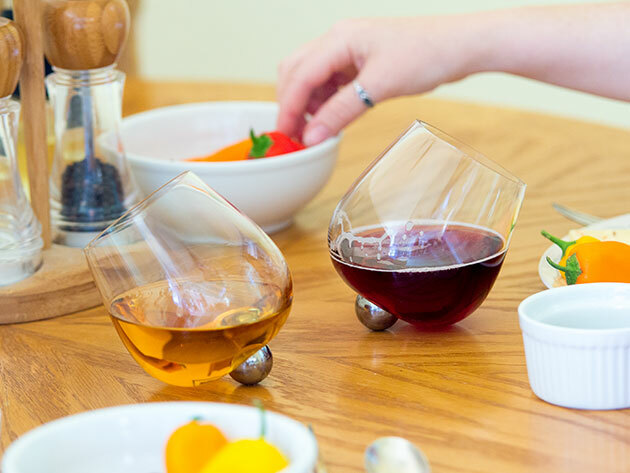 These Aura Glass Non-Spill Drinking Glasses feature an original design that prevents spilling while also aerating wine to enhance the flavor. Not a small feat! The patented glass spins on a stainless steel ball to promote aeration, and this same pivoting design keeps the glass from being knocked over. They also just happen to look great. Save 58% on a set of two with our Black Friday deal that discounts the original price from $96.80 to $48.99 and then goes even further to drop the price to $39.99 . 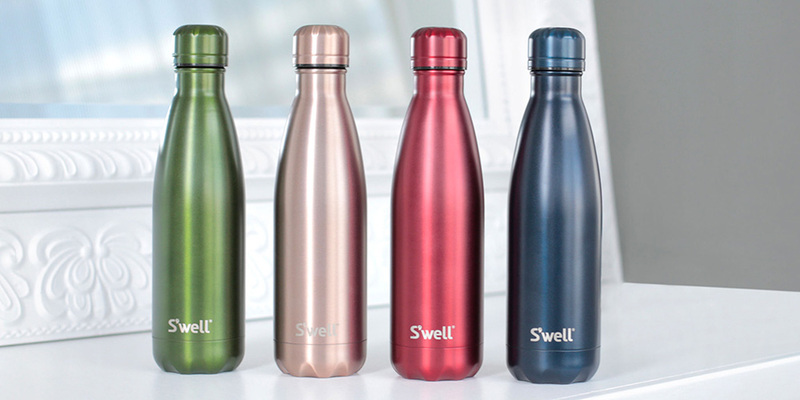 Keep your hot drinks hot and cold drinks cold with the S’well ‘Gem Collection’ Water Bottle . These elegant-looking bottles solve the problem of lukewarm drinks with their temperature-regulating technology that keeps cold drinks cold for 24 hours and hot drinks hot for 12 hours. They are also lightweight, durable, and spill-proof. Just toss them into your bag and never worry about everything getting wet! For Black Friday only, use promo code BFRIDAY50 to save 50% ! It’s a special code just for this deal that will slash the original price of $42 to $21. This compact design features three high-quality camera lenses, an adjustable brightness LED, and a selfie mirror to take care of all your photography needs. Flip between fish-eye, wide angle, and macro lenses with just the touch of a finger, and use the detachable LED to take expert photos no matter the environment. We’re offering it for only $34.99 , 40% off the original MSRP of $59. These ROAV sunglasses are extremely compact, folding down into the thinness of an iPhone so you can store them pretty much anywhere. Plus, the lenses are scratch and shatter resistant, so you don’t have to worry about them breaking. And as chic as they are, they also provide 100% protection from harmful UVA and UVB rays, expertly combining fashion with function. For Black Friday, we’re offering them up at a 31% discount , dropping the price from $145 to $99.99! Iced coffee lovers, it’s truly your lucky day! The Hyperchiller Coffee Chiller cools hot coffee by as much as 130 degrees in only a minute. Simply pour your freshly brewed coffee into the Hyperchiller and wait 60 seconds for it to cool. 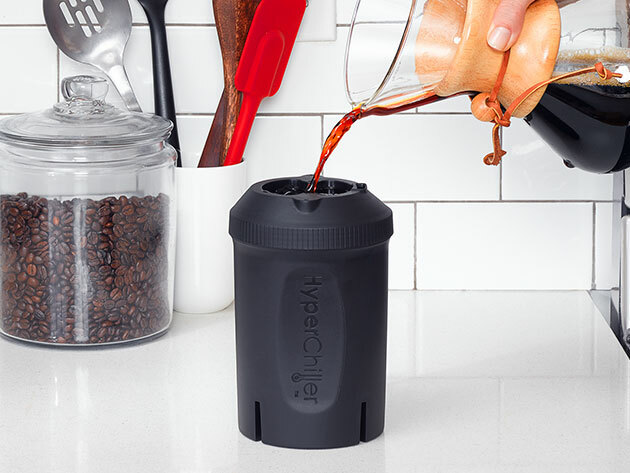 The multi-chamber design (which holds the ice separate from the coffee to prevent it from getting watered down) ensures that rich, flavorful coffee will cool down quickly without losing its wonderful taste. Get yours today for only $45 ! That’s a special Black Friday savings of 25% off the original MSRP of $60. With the TREBLAB X11 Earphones , you can experience powerful sound with the flexibility to go about your day without being burdened by wires. Featuring elite Bluetooth audio and passive noise cancellation, these earphones will provide high-quality sound whether you’re working out or simply working. A built-in mic also makes it easy to take calls wherever you happen to be with a single touch. 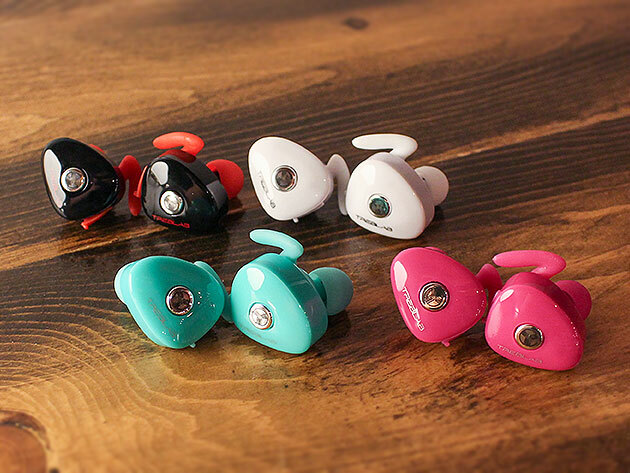 Wear them as a single earpiece or a pair, and enjoy a multi-device connection. Get yours today for only $36.99, a whopping 81% discount from the original MSRP of $199.9. Going to the bathroom at night was always a bit of a challenge. You either had to turn on all the lights and risk waking up your partner and other sleepers, or you had to brave the trip and stumble around in the dark until you located what you needed. Not the best situation any way you look at it! 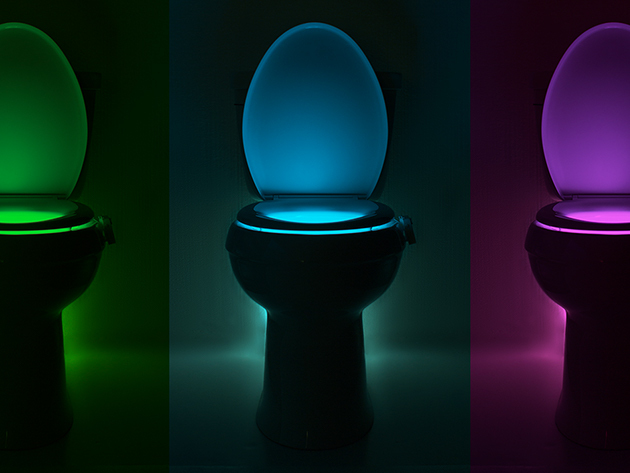 Enter the IllumiBowl: Germ Defense Toilet Night Light . Using special light technology, it kills common toilet germs and uses motion-sensors to activate a soft light as soon as someone enters the bathroom. The IllumiBowl is battery-powered, snaps on directly to the side of the toilet, and can be easily wiped down with a cloth to stay clean. It’s also great for potty training children! For Black Friday, we’re offering it for only $12.99, a 35% discount from the original price of $19.99. This post contains affiliate links to Simplemost Shop, our online store. Simplemost may get a commission from the purchase of these products.